John Greed is an online and high street Jewellery seller which seems to focus on the ever popular charms market. The website has a clear modern look with again a big focus on charms, although looking through the menu bar reveals lots of other categories. These categories include male and female selections, occasion jewellery, watches and engraving. Looking further down the homepage there’s a list of brand named jewellery plus a comprehensive site description. The delivery and returns options are clearly shown along with the free delivery offer subject to a minimum order spend. The contact telephone number can be found right at the top of the page in a prominent position. The contact mailing address can be found on the footer menu. If you are a social type then John Greed operates a number of social pages in most or the most popular social networks. 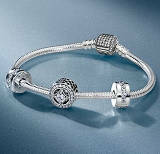 The Pandora brand seems to be pushed the most so let’s look at a purchase to test the user friendliness of the site. The product detail page is easy to use and very intuitive. These’s a drop down menus for an extended description, return and delivery information and product reviews. At the checkout you can review the product and quantity, use a promo code and review the delivery cost. Payment methods include credit/debit card and Paypal checkout. Going back to purchasing there’s a wish list where you can add products of interest whilst browsing. All in the entire store is simple to use with useful features to help you shop. I don’t really have anything negative to say and to complain would be truly nit picking.